The job market for former Trump administration officials has been varied at best, as former Homeland Security Secretary Kirstjen Nielsen and others soon departing the Trump administration are about to learn. Nielsen left amid a White House push for more restrictive immigration policies and the resignation of her top deputy and the officials who headed the Secret Service; Immigration and Customs Enforcement; and the Federal Emergency Management Agency. Typically, new leaders at federal agencies want to hire their own senior aides, so more Department of Homeland Security staffers could soon need to brush up their resumes. Over the last three years, more than 60 high-ranking White House and executive branch officials have stepped down — some fired, others departing on their own. Those exiting the Trump administration have to deal with a job market that may not be as friendly as the ones in which prior Cabinet members negotiated transitions to prominent law firms, speaking and consulting gigs, or academic life. 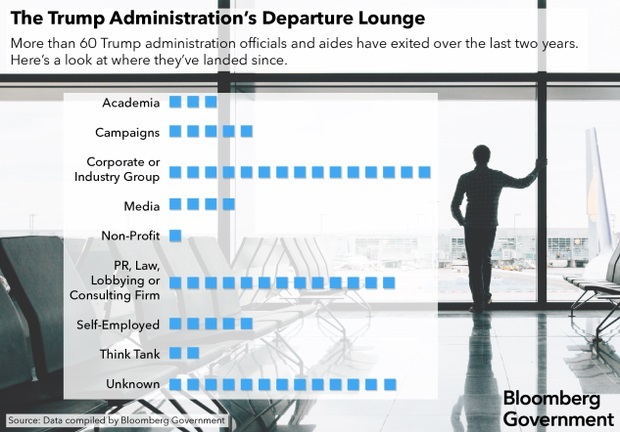 “This isn’t the usual kind of partisan crowd that goes through the revolving door, this is something completely different,” said Ivan Adler, a K Street headhunter at The McCormick Group. Senior aides with expertise in an industry, long Washington resumes, or a reputation for no-drama job performance appear to have had the easiest post-administration transitions. For instance, Eli Miller, Treasury Secretary Steven Mnuchin’s former chief of staff, resigned on April 4 and stepped into a new job less than a week later. He’ll be working on public policy for private equity firm Blackstone. He had previously worked for the Trump campaign and an aide to former Speaker John Boehner (R-Ohio). Former chief of staff to Vice President Mike Pence Josh Pitcock landed at Oracle Corp.
Michael Short, who worked in the White House communications office and the Republican National Committee, is now doing public relations work at the National Association of Manufacturers. Ex-White House Deputy Press Secretary Lindsay Walters went to public relations giant Edelman. Former National Economic Council deputy director Everett Eissenstat went to General Motors Co.
Hope Hicks, former White House communications director, was hired as chief communications officer at Fox, the parent company of Fox News Channel. Drew Maloney, who led the Treasury’s legislative affairs office and helped push through tax overhaul, became the chief executive of the American Investment Council, the industry group for private equity firms. Mike Catanzaro, who oversaw energy policy on the National Economic Council, has rejoined top GOP lobbying firm CGCN Group. Nikki Haley, the former U.S. ambassador to the United Nations, has been elected to Boeing Co.’s board of directors. Former Chief White House Council Don McGahn returned to white-shoe law firm Jones Day. As Nielsen walked out of the DHS headquarters April 10, some civil liberties, immigration groups and lawmakers including Rep. Alexandria Ocasio-Cortez (D-N.Y.) were lobbying against Nielsen’s future job prospects. More than three-dozen civil society and immigration advocacy groups listed her name in a letter to all Fortune 500 companies asking them not to consider hiring her. “Being the public face of immigration enforcement is a tough assignment under normal circumstances, and there hasn’t been a normal day in this area for more than two years as our country’s divide has widened,” said Stewart Verdery, a former assistant secretary for Homeland Security during George W. Bush’s administration who was among the former officials who pushed for Nielsen’s confirmation. “I hope that the public recognizes that the Department of Homeland Security does more than immigration,” he said. Nielsen’s deep background in homeland security issues, with an expertise in cybersecurity policy, could still make her an appealing prospect to future employers or to clients. Nielsen ran an advisory firm called Sunesis Consulting, LLC before joining the Trump administration, earning a salary of more than $260,000, according to her financial disclosure forms. She also worked in George W. Bush’s administration, serving in the White House’s Homeland Security Council and establishing the Transportation Security Administration’s first legislative affairs office. Should she decide to restart her consulting business, Nielsen could privately provide advice to corporations because only direct lobbying activities require disclosure. Several people close to Nielsen told Bloomberg Government that she has no interest in lobbying. Jeh Johnson, Obama’s last Homeland Security secretary, is a partner at the law firm of Paul, Weiss, Rifkind, Wharton and Garrison. He’s also a senior fellow at the Harvard Kennedy School and is on the board of directors of the Center for a New American Security and of Lockheed Martin Corp.
As for other people who left Trump’s Cabinet, former Defense Secretary Jim Mattis has returned to the Hoover Institution at Stanford University and former Secretary of State and top Exxon Mobil Corp. executive Rex Tillerson is booked as the keynote spaker at an energy industry event later this year. Of the three Cabinet officers who left amid questions about ethics or taxpayer-funded travel, former Veterans Affairs Secretary David Shulkin has become the chief innovation officer at Sanford Health and a board member of ArmadaHealth; former Interior Secretary Ryan Zinke went to Turnberry Solutions, a small lobbying firm staffed with pro-Trump advocates, and former HHS Secretary Tom Price is on the board of advisers for Jackson Healthcare. Trump’s first administrator of the Environmental Protection Agency, Scott Pruitt, has been promoting coal exports for a friend, coal magnate baron Joseph W. Craft III, according to a Washington Post report. Former Food and Drug Administration chief Scott Gottlieb has become a resident fellow at the American Enterprise Institute.